Today is officially the first day of spring! And of course that means I’m getting fired up for Easter. I pulling my Easter stuff out this week and realized just how many fake plastic eggs I have. Easily hundreds. And so I thought I would experiment on a few with my Dremel to see what I could come up with. This sorta ‘playing’ is exactly how I stumbled across the fact you could etch and illuminate plastic christmas balls and we all know how cool that came out. 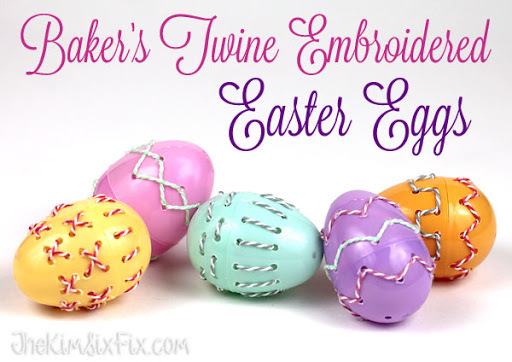 I found some seasonal bakers twine for $1 and I thought it would be really cool if I could ‘stitch’ the eggshell with it and so I used the Dremel tool to punch holes into the egg that I could run the twine though. You could do a similar thing with a drill and small gauge bit, but the Dremel was easier to use and the holes were the perfect size. Next I wrapped the end of the twine in tape. Because of the curve of the egg you could use a real needle to ‘sew’ with and the twine itself was too flexible (and had the tendency to fray). I tried all sorts of different patterns and designs. It was actually pretty fun. Even my kids got into the act. Once one side of the egg was complete it was time to work on the other. Once I got the hang of it, it went pretty fast. They certainly are unique now! Check that out! My first gif! SO FANCY! !